SU, for those that don't know, is the acronym for the greatest of all the Spectrum magazines (despite what the rest of comp.sys.sinclair might say ;-) ) called Sinclair User. Here, for you perusal, is a typical SU review, and the key points that made them so great. (Reproduced without kind permission of Emap, or whoever it was). 1. Ready for when YS/Crash readers abandon their magazines in favour of SU, they have a score system for them. By scoring out of 10, they avoided using any high numbers that other magazine readers might have trouble understanding. Another reason why the page numbers were kept so small (in font size); to avoid the chances of them seeing a 3 digit number and panicking. 2. Printed in black and white, in keeping with the Spectrum software's tradition of using only two colours. Other unscrupulous magazines would often use more, but SU always resisted the temptation. Also, probably printed on recycled paper (obviously not just "cheap stuff" as Crash might have you believe. They felt it neccessary to just reduce the number of pages in their mag to help the environment. It was just luck that most of the readers also used it to wipe their bums.). 3. Spelling mistakes. Never a magazine to scrimp on competitions, readers were often invited to spot the deliberate spelling mistakes and receive expensive prizes as a reward. 4. Humour. This was an area untouched by other magazines that dare not try to crack jokes for fear of looking stupid, and indeed they did. However, SU kept up a constant barrage of wit and humour, destined to keep their readers loyal (until about 1991, cough). 5. No sign of Kamikaze bear. The only trick they pinched off other mags was to display pictures of the bear as infrequently as possible. Unfortunately, with all their time spent making the magazine great, this was often overlooked. 6. The reviewers signature. 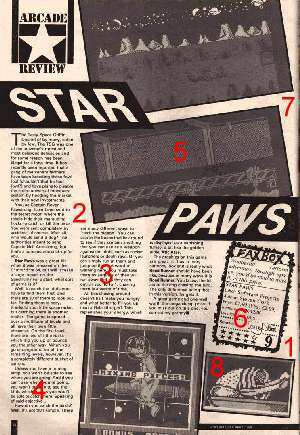 To make sure it wasn't a sabotage job by writer for an enemy magazine (which can obviously be assumed since this game seems to have scored 9/10 for some reason), a reviewers signature was required, in their own blood of course. However, this reviewers handwriting does give the indication that he is only about 5 years old, so he is obviously an undercover editor from a rival mag. 7. Blank spaces. These were left free for readers to write in their own notes. 8. The picture of a half-eaten chicken. This kind of image is almost an icon in Spectrum gaming, having appeared in quite a few other games, including the classic Atic Atac. So there we are. 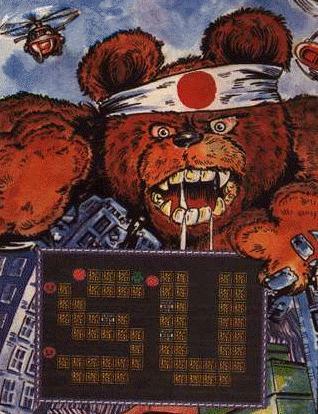 And just to finish off, a nice gratuitus piccy of everyone's favourite, Kamikaze Bear, showing how the game Rampage was based on his amazing exploits. We show you how SU probably actually invented the Spectrum, and were also forced to buy issues of YS for fear of a government monopolies enquiry. Help me stamp out the evil that is corrupting the word of Sinclair User! Stephen Smith - SU reader to the end!